The present order of the cosmos as best known. This is seemingly fixed, unchanging, and permanent to those who exist within known reality. Reality is torn asunder by events of cosmic proportions. The survivors of the cataclysm use the components, elements, and foundations of the old order to construct a new form of reality. This reality is one that is more beneficial to those who craft it as they create the conditions necessary to thrive. Also shown are other cycles observed in nature. In each case a similar pattern of new forms transformed from the elements of the old is present. The life cycle is an excellent example of the same concept at work. Plants, fed and energized by the light of the sun, grow and feed herbivores. These herbivores become prey to carnivores who eventually die. When the carnivores die their bodies break down to their core components, enriching the soil enabling the growth of new plant life thus ensuring the cycle continues.5 The seasons follow a similar march from the cold of winter to the promise of spring, the bounty of summer, and the retreat and preparations of autumn for the coming winter.6 Water, in turn, pours from the sky as rain and snow, runs across the land in rivers and streams feeding lakes, oceans, and glaciers before evaporating and returning to the atmosphere.7 Even in the case of the cycle of living, beginning with birth and ending with death, those who reach the end of their individual cycles contribute directly and indirectly to the lives of those who follow them.8 Whether through reproduction or the influence of their actions on the world all that lives plays a critical role in shaping the lives of those who follow. 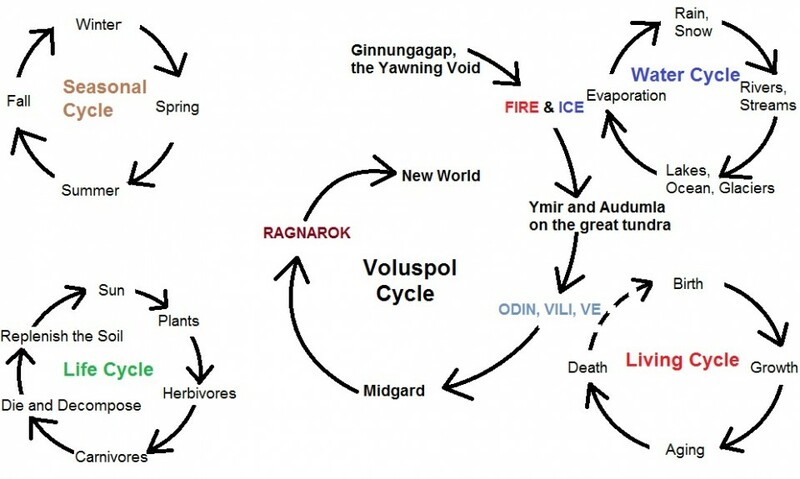 The progression of events and worlds in the Voluspa follows similar logic to the cycles of life. The end of each world does not herald, as it does in the Abrahamic tradition, the end of reality. Each reality dies and its components, catalyzed by the upheaval that brought their demise, are reformed into a new reality. The demise of one world gives rise to a new one with the universe continuing on much like the natural cycles. This cycle is mirrored in the creation of humans who were made from two dead pieces of driftwood.9 Just as the Gods made Midgard from pre-existing materials they fashioned the first two humans from existing materials, giving unto them the gifts of heat, breath, and intellect. Nothing comes from nothing in Heathen cosmology as all things obey these fundamental dynamics. A cyclical understanding of the universe is distinct from the more linear, mechanistic view which prevails in society thanks to Abrahamic influence. Reality, whether by the Big Bang or act of God, comes into existence with set rules and boundaries. If and when it ends that end is it. In such linear views of reality everything is arranged like some vast book with a clear beginning, end, and narrative describing how one gets from one to the other. This imposes a top-down, dominating understanding of the world where the ideas and opinions in line with this narrative are the only ones worthy of consideration and all others are secondary at best. It is an ideal perspective for asserting singular truths and monopolies on information at the cost of constricting discourse, discussion, and debate. This cyclical understanding of the universe approaches reality from a different perspective. When one thing dies, breaks down, or falls apart its constituent elements and components go back into the world to facilitate new life and new creations. Even if a person or an animal dies without siring offspring they contribute to new life both literally, in the form of their decomposing body, and abstractly through the wisdom gained from their experiences, the fruits of their labor, and the impact their deeds had on the world around them. Just as the seasons progress so do lives, societies, and the universe. These broad strokes are consistent even as the details vary. Another crucial element of Heathen cosmology is the relationship between the Gods and the universe. Unlike Abrahamic tradition, where God is present in all of creation while also being transcendent and outside of it,10 the Gods exist within the same reality as us and are not above or outside of it. While They engage in a great act of creation when shaping Midgard this is done within the context already established patterns and principles. Reality is not willed into existence ex nihilo11 but created from existing components. They also do not create the whole of the universe. When or where the Yggdrasil came from is not known and only Midgard and Asgard are mentioned as creations of the Gods in the lore.12 Even with all Their preparations, might, and wisdom the Gods cannot totally avert the inevitability of Ragnarok and Their own demise. They are a part of the same reality as the rest of us and, like everything else, are bound to its cycles. What this suggests for Heathens is very profound. If, as the lore shows, reality is the result of endless moving cycles and great upheaval and transformation then we must consider how we live with a similar understanding. When the world and how it is organized is not permanent but can be changed through action this suggests the same is true for our lives, society, and the world around us. The main constants in such a conception of reality are transformation, interaction, and webs of relationship. This poses a serious question to Heathens and adherents of such an understanding of reality. If all things can be changed through deliberate action one must ask what needs to be changed and what should be preserved. One of the main themes of the coming of Ragnarok is the struggle of the Gods, especially Odin, to delay the destruction of the Nine Worlds in Surtr’s flames. Their actions to maintain the order of reality as it currently is, on the grand scale, suggest there are certain conditions and arrangements worth preserving. Supplementing this are the actions of Odin, Vili, and Ve in ending the order dominated by Ymir and its offspring to pave the way for Midgard. What is clear is that which is beneficial to life is worthy of preservation and support. That which is harmful, stifling, or causes suffering must be replaced with new arrangements that are nurturing, supportive, and beneficial to as many as possible. Just as positive change is achieved through deliberate action so too is negative, detrimental change realized. As has been shown in the cycles of reality change occurs because of action. All things eventually fade, age, and pass on but their replacement by newer forms is only possible through deeds, not waiting for the inevitable to happen on its own. The yawning gap was only replaced through the surging of fire and ice. Ymir’s waste was only replaced by Midgard through Odin, Vili, and Ve’s heroic uprising. Midgard and the Nine Worlds, in turn, will be replaced by the world yet to come because of the actions of the followers of Surtr, other Jotnar, and Odin’s plans and deeds in preparation for the final day. Deeds drive the worlds, transform them, and make it possible for life to become better. It is also possible, as shown by Rangarok, for deeds to ruin them. The question we are left with is what should be changed, what should be preserved, and how to best ensure the most beneficial order for as many lives as possible. Ryan Smith is a practicing Heathen sworn to Odin living in the San Francisco Bay Area. He is a co-founder of Heathens United Against Racism and a founding member of the Golden Gate Kindred. He recently finished his Masters in History, specializing in economic history, the modern Middle East, and maritime history, and currently works as an outdoor educator.